We are a leading importer, exporter of Granulated Cork. Our product range also comprises of Rubberized Cork Products, Cork Products and Anti Vibration Pads. 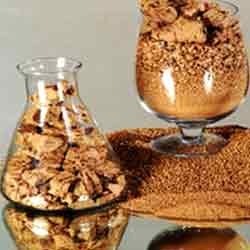 These Granulated Corks are available in various sizes and are highly demanded in the market. Backed by a team of highly experienced professionals, we are actively involved in offering a broad assortment of Granulated Cork to our customers. These products are assembled using quality tested components as per the defined quality standards and widely used to highlight walls, panels, door panels and cupboard doors. Further, the offered products can be availed at the highly competitive price range. Used to highlight walls, panels, door panels, cupboard doors etc. Looking for Granulated Cork ?